From left: SFA STEM students Steven Choate, Tenay Barker, Lauren Kiefer and Henry Braulio network with potential employers during SFA's first STEM Career and Internship Expo. NACOGDOCHES, Texas - Students filled the Baker Pattillo Student Center Grand Ballroom Thursday, networking with potential employers during Stephen F. Austin State University's first STEM Career and Internship Expo. 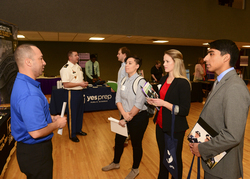 Representatives from Tyson, the Peace Corps, Lockheed Martin and more than a dozen other employers were in attendance at the event, hosted by SFA's Center for Career and Professional Development. "For students who are exploring major or career options, these events are a great way to interact face-to-face with companies to learn more about industries and career paths that are available to them," said Jamie Bouldin, director of the career center. "For students who are seeking internships and jobs, it's a convenient way to meet many companies at once who are all interested in hiring Lumberjacks for their positions." While the career center holds multiple career expos per year, this is the first specifically targeting STEM students. "We are very excited about providing STEM students with the opportunity to interact with companies on campus and very appreciative of the support and involvement of the College of Sciences and Mathematics," Bouldin said. For more information about SFA's Center for Career and Professional Development and the services it offers, visit sfasu.edu/ccpd/.